Regular dental care can prevent oral issues that can be the cause of a myriad of health, performance, and behavioural problems. A healthy set of teeth, and dental care, plays a huge role in a horse’s overall health and well-being. A horse that is in pain because of dental issues will not be able to perform to its full potential. Ideally designed for near-continuous grazing, horses’ teeth are long – around 10 centimeters – and continue to erupt through the gums a few millimeters a year to accommodate for a lifetime of tearing and chewing rough fibrous plant material. Twelve incisors at the front of the mouth nip at food and 24 molars grind it up. Over centuries, humans have altered the horse’s traditional diet and eating habits. We offer soft hay and processed feed, which are chewed in a different manner than pasture grasses. We have reduced pasture time and asked horses to live in stables. The horse simply isn’t eating the same way, or even the same food, as his ancestors. The upshot is often tooth-related health, behaviour, and performance issues. These behaviours may signal something is awry in the mouth. Mouth pain creates jaw tension which in turn can produce neck and back issues, lameness, and a general unwillingness to work. Problems under saddle are further exacerbated as the horse concentrates on the pain instead of the rider’s aids. 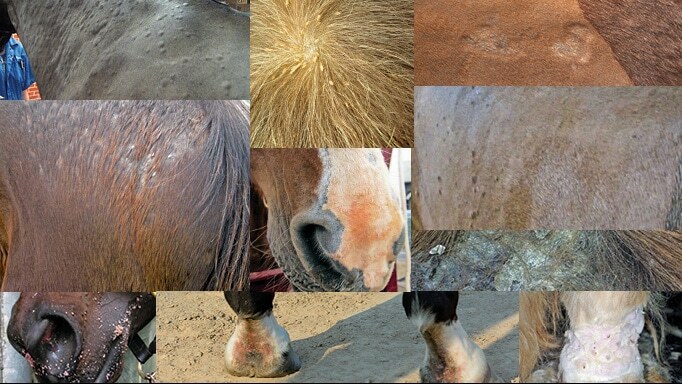 The above signs and symptoms can indicate myriad other diseases and conditions, notes Dr. James Carmalt, professor of equine surgery at the University of Saskatchewan’s Western College of Veterinary Medicine and Canada’s only veterinarian board-certified in equine dentistry by the American Veterinary Dental College. 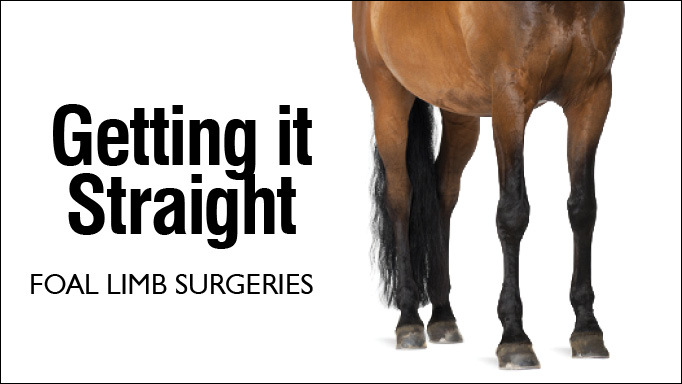 “It’s extremely important to evaluate the whole horse and not focus specifically on only the teeth,” he says, adding that regular dental exams are an important facet of routine care. He explains the goal is to improve or maintain the biomechanics of chewing, prevent disease, and preserve the teeth over the horse’s lifetime. Malocclusions – poor tooth contact that results in abnormal wear patterns – are the most common problems Carmalt observes. Because a horse’s upper jaw is wider than the lower one and the grinding surface of the cheek teeth slope slightly, the corresponding upper and lower cheek teeth don’t connect – or occlude – exactly. While this provides efficient crushing of food due to an elliptical chewing action, one part of the tooth is often worn away, while the rest continue to grow. Sharp enamel points form on the outside of the upper teeth and the inside of the lower teeth, causing cheek and tongue sores and impeding chewing. Other overgrowths include: waves, where the entire grinding surface is uneven; hooks on the upper first and lower last cheek teeth; and ramps, which are like hooks, but more gradually sloped. Incisors, meanwhile, can be affected by jaw misalignments. For example, overbite (parrot mouth) and underbite (pig, sow mouth) will eventually lead to too-long incisors. In turn, that creates cheek teeth occlusion problems. If addressed at an early age, jaw issues can be corrected with surgery (braces are sometimes even used) or at least minimized. Cribbing and wood chewing may also cause wear on the incisors, which typically meet on a flat plane. To correct points and overgrowths, excess tooth material is filed down or rasped in a process generally known as floating using an array of specially-designed hand and power tools. As Carmalt says, “Gone are the days of a quick hand in the mouth and waving a float around.” Oral health isn’t just about banishing points; a host of other issues could be lurking in a horse’s mouth. Retained caps – A foal’s 24 deciduous (baby) teeth, or “caps,” begin being pushed out by permanent, adult teeth beginning around age 2½. Usually the caps just pop off, but occasionally they are retained and must be removed manually to prevent discomfort and displacement of adult teeth. Wolf teeth – Between ages one and three, many horses sprout two to four nubby teeth in the space between the incisors and the cheek teeth. These vestigial (no longer anatomically functional) wolf teeth are positioned where the bit sits in the mouth and can trigger pain and irritation, so they’re usually removed. “Blind” wolf teeth, those that haven’t erupted through the gum, can also create bit-related discomfort and are often extracted as well. Canine teeth – Also vestigial, these large teeth, believed to have once been used for fighting, are located near the incisors of many, but not all, male horses. They can become quite sharp, causing tongue ulcers and interfering with the bit, and are often removed. Loose, missing, and fractured teeth – By the time a horse is in its 20s-30s, with no more tooth to surface from below the gum, teeth loosen and often fall out on their own or need to be removed. Loose or fractured teeth in younger horses usually are a result of trauma (falling, being kicked, etc.) and typically affect the incisors. Good teeth are integral to effective chewing and a well-functioning digestive system. 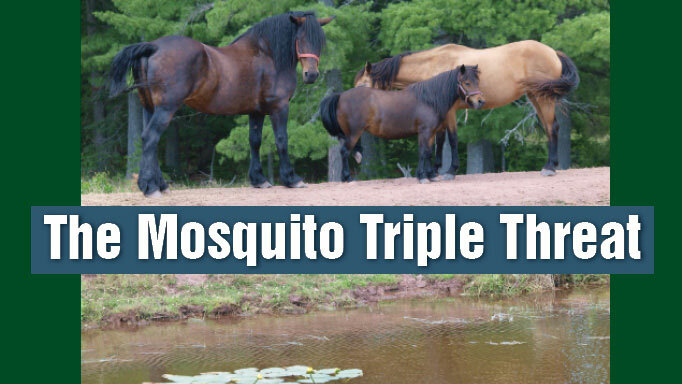 Without them, a horse may be at risk for serious health conditions. 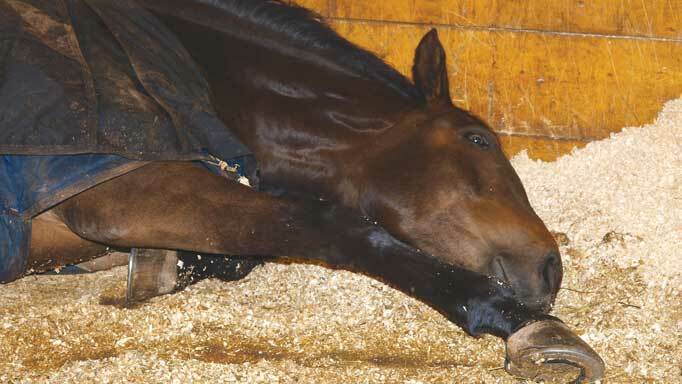 Horse owners seeking sound dental care should find a veterinarian who performs “complete oral examinations under sedation,” recommends Carmalt (see sidebar for what that entails.) But, he warns, resolving dental problems might take time – and a lot of money. He also “strongly advises” his clients to obtain all-inclusive veterinary insurance for peace of mind and to allow specialists to do the best job without being hindered by cost constraints. The last decade in particular has been “incredible,” for the field of equine dentistry, says Carmalt, citing in particular research into temporomandibular joint disease, the cellular structure of teeth, root canals, and advanced imaging techniques – all advances which will help the horse achieve optimum health, comfort, and athletic potential. 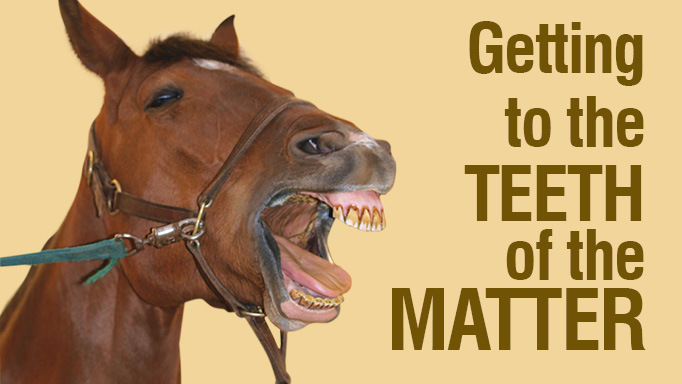 Most horses have all their adult teeth by age five. Dr. Carmalt estimates about 60 per cent of his work involves diseases of the equine head. Inserts a full-mouth speculum to keep the jaws open. Scans the entire oral cavity, including teeth, gums, tongue, and cheeks, using a light and dental mirror (or oral endoscope). Records abnormalities and sometimes takes X-rays before performing necessary corrective steps. Despite the miniature horse’s small stature, their wee mouths are crammed with the same size and number of teeth as their larger counterparts.